“I’m not done,” Rose said Thursday in his first appearance before media since his season ending knee injury Nov. 22. “I know that He’s preparing me for something bigger. Of course, right now when you’re living in the moment, you just don’t understand certain things. But I think if I was to look 10 years from now and be in the future looking back, I think this is going to be minor. It’s something that just happened. I’m never going to stop. I could tear it or hurt myself 10 more times, I’m never going to stop. I think it’s worth waiting to see. It’s been worthwhile until the playoffs in 2012 when Rose suffered that catastrophic anterior cruciate ligament tear that cost him all of last season. Rose’s return was one of the biggest stories of the 2013-14 season, and it seemed to be getting really interesting until Rose tore the meniscus in his other knee. That required surgery, which will keep Rose out all of this season. Rose sounded a bit in answer to one question that he may be holding the door open to a return later this season if the healing process is quicker than anticipated. But that was likely a remnant of all the criticism Rose received last season for not playing. He has been declared out until next season by doctors and team management and that will not change. But even with having to wait yet another season, a player like Rose is worth waiting for because players with the skill and abilities of Rose come along so infrequently. And people as humble and team oriented as Rose are perhaps even more rare. You can search decades in the life of a franchise for someone like Derrick Rose. You don’t walk away from him, especially when he isn’t walking away from you. There’s been this rumble in the Bulls basketball community, certainly understandable given the hope of this season turned so quickly to disappointment, that there’s no longer any point. It’s a natural reaction to this kind of shock, the death, in effect, of a basketball season. But perhaps also of a team. They tried, but the things he did didn’t lead really anywhere. So move on. You don’t do that when there’s still so much Rose can bring. Everyone around him knows how much he put into rehabilitation. It’s in some respect why the Bulls players are having so much difficulty getting past his injury this time. Not so much the loss of a season, but to see how much he did and cared and wanted it for himself and them, and then to see it taken away like that. A simple cut, a bounce pass missed, a move to get back in transition. Rose even still remains baffled. So Rose, who hobbled into the media conference in the United Center on crutches wearing a red hooded sweatshirt, begins the painful process once again. Basically rehabilitating for two years. No fun. 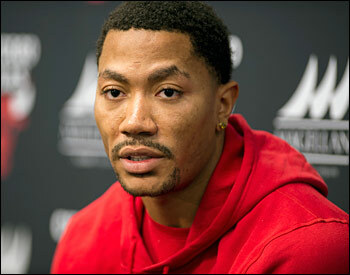 But Rose is confident and committed and concerned, and that is what should be encouraging to the Bulls. Will he be the same player? Can he be? Is it all worth it? Can we go through this again? If it’s easy, anyone could do it. If you are pursuing something special it should be hard. There’s all sorts of speculation about the Bulls beyond this season. But there’s no reason to believe with Rose they cannot field a competitive team immediately. Joakim Noah and Jimmy Butler are under contract. Luol Deng, though a free agent, could return. They could bring over former No. 1 draft pick Nikola Mirotic from Europe. And depending on how Charlotte does they could have two No. 1 draft picks in a deep draft, perhaps one in the lottery. But it all works better with Rose. So Rose was asked, in effect, about his commitment as well. He was asked, what do you say to people who say Bulls should move on? “That the Bulls should move on… What do you mean?” Rose said with a pause. That Derrick got hurt two straight years and the Bulls should move on without you. If you’re the Bulls, what do you do? “What can I say to that?” Rose said, taking a long pause. He was thinking, and you only wonder what he was processing. He is Chicago; he is the Bulls. He knows who he is and is sure what he will be again. “You can be a fool if you want to,” Rose said. The response, a bit more relaxed than some of his others, drew some nervous laughter. But it seemed to clear the air and seize the moment. That’s the significance of the situation and circumstances. As discouraged as a fan as you may be by Rose’s injury, it’s most important to know that as depressed as Rose may have been, he’s excited about the future. And if he can endure this, so can everyone else. “I don’t have anything to complain about,” said Rose. “I think the hard part that I had to go through in life, period, is living in poverty and not being able to get what I want. I’ve got everything that I want and I just can’t play the game that I love playing. I have my son. I think he’s going to be huge in this process, me having to be around him a lot. I don’t know if God wants me to slow down a little bit. Me having this time, time off just to think and grow as a man, grow as a businessman. Of course I’m a basketball player. “I know I am (going to be the same player). A better player,” insisted Rose. “If anything, this should even me out. When I think about it, the injury, I just turned and this happened, kind of like a freak accident. I put all I had into coming back and if this was to happen 10 more times I’d be able to deal with it. Whenever that is, it will be worth the wait for a very special person and athlete.